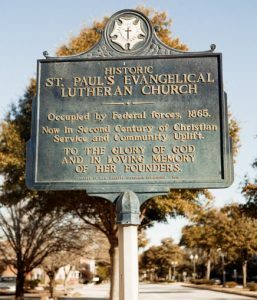 On May 31, 1858, fifty-eight people attended an organizational meeting, held in the Old Presbyterian Church, then located on Front Street, between Dock and Orange Streets. The enthusiasm and commitment was so great that plans were made to call a pastor. The Rev. John H. Mengert became the pastor in December 1858. Following his arrival, a meeting was held on February 8, 1859, at which time the first officers of the church were elected and charged to find a suitable location for a church edifice. The trustees recommended a site on Market Street near Sixth as the best possible location, which cost the church $2,500. The Trustees were directed to proceed and by June, 1859, Mr. H. Vollers submitted a plan for a Gothic church, 65 x 40 feet, with a vestry room in the rear, 30 x 60 feet. The estimated cost of the proposed structure was $5,000 to $6,000. The cornerstone of the building was laid on September 6, 1859. The congregation began worship services and a Sunday School program in the vestry room in 1861. The early successes of the congregation were halted due to outside factors. In April of 1861, the War Between the States began. Many young men in the congregation volunteered their services for the Southern Cause. The church building, begun in 1859, was not completed, largely because of the scarcity of building materials. The yellow fever epidemic in the fall of 1862 devastated the city. It has never been determined the exact number of members that succumbed to this terrible disease. Pastor Mengert resigned in 1862, leaving the beleaguered congregation leaderless. Never completely secure financially, the church sold two lots on Sixth and Princess Streets for Confederate Money which proved worthless after the War ended. The lots were repurchased in 1869 with US dollars. After the fall of Fort Fisher in January of 1865, Wilmington was occupied by Federal troops. The Bellamy Mansion served as the headquarters for the Officer Corps; the enlisted troops camped in St. Paul’s churchyard. The troops stabled their horses in the unfinished church and took wooden furnishings to use as firewood. The smoke from the campfires blackened the steeple and the exterior of the church. The discouraged band of Christians contemplated selling the property. Fortunately, the church was not abandoned and by the summer of 1869, the building was completed, and was dedicated on August 22, 1869. Early financial support was derived from the sale of pews. Parishioners were charged a yearly pew rent, which went toward paying the Pastor’s salary. A parsonage was constructed in 1871-72, which was occupied by subsequent pastors and their families until 1958, when a house was purchased in the suburbs for that purpose. The building was converted into office and Sunday School use until 1979, when it was razed and the present Administration Building was built. Shortly after the arrival of the second Pastor, Dr. G.D. Bernheim, the pastor and his family taught students in the parsonage to augment his income. This was so successful that a parochial school was begun in 1876, drawing pupils not only from church membership, but from the community at large. It continued until 1881, when the Rev. Bernheim left; it reopened again in the 1890’s, and closed for the last time about 1902. The school occupied the Luther Memorial Building, built in 1883 and located on the corner of Sixth and Princess. The original building burned in 1894, but was promptly replaced, and served as the educational building until 1941, when the present building was erected. Installed in 1869, the first stained glass windows in the church were double Gothic windows of Cathedral glass containing geometric designs. The three windows in the bell tower are thought to be of the original design. By adding an annex, the church was changed from a simple form to a basilica form in 1907-1908. During this renovation, the first of the Memorial Stained Glass windows were installed, depicting the life of Christ. The windows are made of opalescent glass, which contains streaks of color, that when fused gives a milky appearance. Portions are built up of two or more layers of glass to achieve shading. This process was invented by John LaFarge and later adopted by Louis Comfort Tiffany. The last of the windows were installed in 1921. Frank Ellsworth Weeder was the designer and manufacturer of these windows. He was born on 28 May 1868 in Philadelphia, PA, the son of Robert Weeder and Mary Boland who immigrated from Lancashire, England, to Philadelphia in the mid-1800s. The Historical Society of Pennsylvania listed him as a designer in 1892. In 1900, he graduated from the Pennsylvania School of Industrial Art in Philadelphia, where his teacher was Francis (Fanny) Darby Sweeny, considered at that time one of the best colorists in the country. In 1905, he made the Gethsemane Window in the Reformed Church of Oak Lane in Philadelphia. The Rev. Clement Weiser DeChant in his booklet The Story of Religion in Stained Glass, annotates the window thusly, “This window was made in 1905 by Ellsworth Weeder and is perhaps the La Farge and Tiffany Art at its best.” In 1930-1931, he designed, made and installed three clerestory windows in the Princeton University Chapel, Princeton, NJ, the last of which, the Philosophy Window was in honor of the Princeton University President, John Grier Hibben. The Weeder studio and shop was located in the Ludlow Building, 34-36 South 16th Street in Philadelphia. Miss Anna Elsa Kirchner announced her engagement to Mr. Weeder in the Cornell University Alumni News, 1920-21. Although they never married, she was at his bedside in his final hours at Friends Hospital in Philadelphia. He died 27 December 1952 and is buried in Mt. Moriah Cemetery, Philadelphia. The present church was redecorated in 1937 and in 1946. The Casavant Classic Organ, purchased in 1962, contains 3 manuals, a pedal board, 31 stops, 41 ranks and 2,240 pipes. A new Carillon was installed in 1990 to replace an earlier one.